Lelisa Desisa of Ethiopia won the 2018 TCS NYC Marathon in 2:05:59 unofficially on Sunday morning. His time is the second fastest mark ever run on the New York course. With just over one mile to go, Desisa broke defending champion Geoffrey Kamworor of Kenya, who had been in the lead. After Desisa passed Kamworor, Shura Kitata, the youngest in the field, also came up on Kamworor. Kitata soon passed Kamworor, who finished in third, and moved up to second to challenge Desisa. With the second-fastest incoming seed time of 2:04:45, Desisa is the 2013 and 2015 Boston Marathon champion, and was second in 2016. The runner participated in the Nike Breaking2 project in May of 2017, and has since run a 59:52 half-marathon in September of this year. Sunday’s race was extremely fast on both the men’s and women’s side. 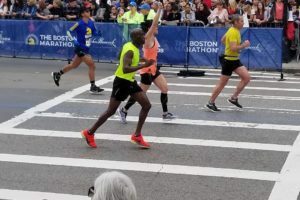 The top five men were all under the 2017 winning time of 2:10:53 set by Kamworor, and the winner was under a minute shy of the course record set by Geoffrey Mutai in 2011 of 2:05:06. Kamworor finished third in 2:06:26, which is still significantly faster than his 2:10 winning time in 2017. Fourth place went to Tamirat Tola of Ethiopia, who finished in 2:08:30, and fifth place went to Daniel Wanjiru of Kenya in 2:10:21.